Edward Gallaway was born on July 1st 1868 in Delphos, OH, and died May 9th 1930 in Chicago. He was baptized Peter Edward but later dropped Peter and went exclusively by Edward. With 14 he learned the printer's art at the Delphos Weekly Herald , traveled the country as typesetter and compositor, in 1889 settled in Fort Payne, AL, and started the newspaper Payne Weekly People . This newspaper folded just a year later. He then traveled with small circuses as the orator for three years. From 1895 on he lived in Chicago. Initially he attempted to establish his own business (Gallaway & Co., Western Carbon Paper Co., McKinney & Gallaway), but ended up working for established print businesses (C.N. Trivess, James McKinney & Co., Bentley-Murray, Rennecker, R.R. Donnelley). In the 1920s he founded the school of print estimators and wrote Estimating for Printers (1927). 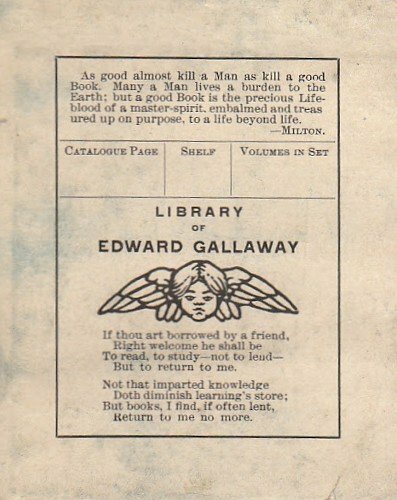 He was known as a book lover, initiated a library committee at the Excelsior lodge of the OddFellows, and had an extensive library himself, including rare and collectible volumes. We know that in the late 1950s some of his books appeared at a second hand book dealer in Chicago. Apparently these were books on gambling. Should you have any of these books in your collection I would appreciate it if you contact me.